At 4 billion light-years in length, the Large Quasar Group (LQG) is the largest known structure in the universe and is some 1600 times larger than the distance from the Milky Way to Andromeda. An international team of astronomers, led by academics from the University of Central Lancashire (UCLan), has found the largest known structure in the universe. The large quasar group (LQG) is so large that it would take a vehicle traveling at the speed of light some 4 billion years to cross it. The team publish their results in the journal Monthly Notices of the Royal Astronomical Society. Quasars are the nuclei of galaxies from the early days of the universe that undergo brief periods of extremely high brightness that make them visible across huge distances. These periods are ‘brief’ in astrophysics terms but actually last 10-100 million years. Since 1982 it has been known that quasars tend to group together in clumps or ‘structures’ of surprisingly large sizes, forming large quasar groups or LQGs. The team, led by Dr Roger Clowes from UCLan’s Jeremiah Horrocks Institute, has identified the LQG which is so significant in size it also challenges the Cosmological Principle: the assumption that the universe, when viewed at a sufficiently large scale, looks the same no matter where you are observing it from. To give some sense of scale, our galaxy, the Milky Way, is separated from its nearest neighbor, the Andromeda Galaxy, by about 0.75 Megaparsecs (Mpc) or 2.5 million light-years. 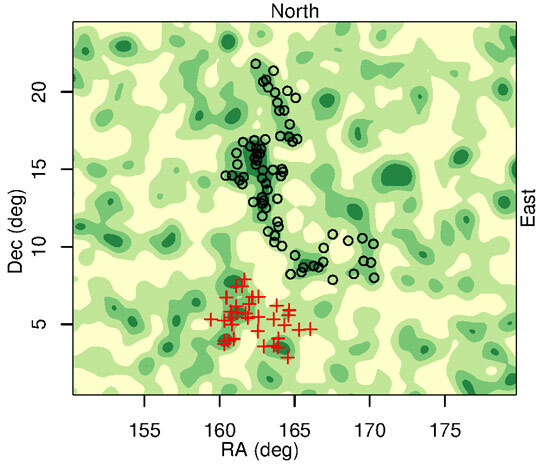 Whole clusters of galaxies can be 2-3 Mpc across but LQGs can be 200 Mpc or more across. Based on the Cosmological Principle and the modern theory of cosmology, calculations suggest that astrophysicists should not be able to find a structure larger than 370 Mpc. Dr Clowes’ newly discovered LQG however has a typical dimension of 500 Mpc. But because it is elongated, its longest dimension is 1200 Mpc (or 4 billion light years) – some 1600 times larger than the distance from the Milky Way to Andromeda. “While it is difficult to fathom the scale of this LQG, we can say quite definitely it is the largest structure ever seen in the entire universe. This is hugely exciting – not least because it runs counter to our current understanding of the scale of the universe. 3 Comments on "The Large Quasar Group, the Largest Structure in the Universe"
Let’s be accurate. It is the standard LCDM cosmological model, with its “homogeneity” assumption, finite Universe, and “WIMP” dark matter that is being falsified. Einstein’s General Relativity is still highly supported by all empirical evidence, but a less idealized version of the cosmological principle is clearly needed, as pointed out by Mandelbrot and others decades ago. We are seeing the gradual unveiling of a new discrete fractal model of the cosmos, and one that probably has no upper or lower bounds to its self-similar hierarchy, i.e., no largest or smallest systems in nature, but rather an infinite hierarchy of systems. This represents the biggest change in cosmological paradigms in 100 years, or possibly 400 years, depending on how you view Einstein’s Special and General Relativity ( as a correction to the Newtonian paradigm, or as a completely new paradigm). So, what the cosmological principle implies? That the universe is a “white blur” seen from far enough? Seems the universe keeps spongy.